Artensoft Photo Mosaic Wizard automatically creates one of the most outstanding effects that can be seen in an image: it creates an image from many others. To do so, it uses a very powerful rendering engine that analyzes all the photos and images that we indicate that it can use so as to join them and form the composition. 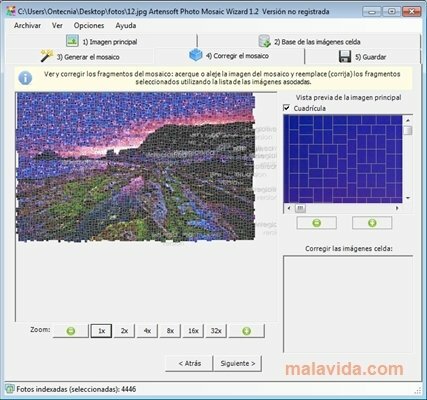 To create the compositions, Artensoft Photo Mosaic Wizard allows you to download from different databases with thousands of photos to index them, because it is more than probable that the vast majority of users don't have the 1,500 photographs that it needs as a minimum to make sure that it will work properly. Furthermore, they have to cover a whole array of colors and shapes so as to be able to create any collage. Once all the photos that we add are analyzed, we will be able to easily create our own collage. The application will show us a wizard with each step of the process that we have to complete to reach our goal, from indicating the base photo all the way through to the final collage. 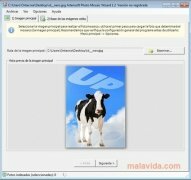 This application may require that you download certain DLL libraries separately (msvcr70.dll) and copy them to the installation folder. The trial version can be used for 30 days.